No matter what industry or market they choose to focus on, successful investors all have one thing in common that underpins their investing activities. This fundamental task is something that is so obviously important and yet it is one of the first things to be overlooked or put off. That's right, I'm talking about the dreaded 'P' word...paperwork! The problem with paperwork is, none of us really enjoy it and we tend to shove it aside until later. However, later never really comes and we end up with a general mess to deal with at some point in the future, usually around tax time. 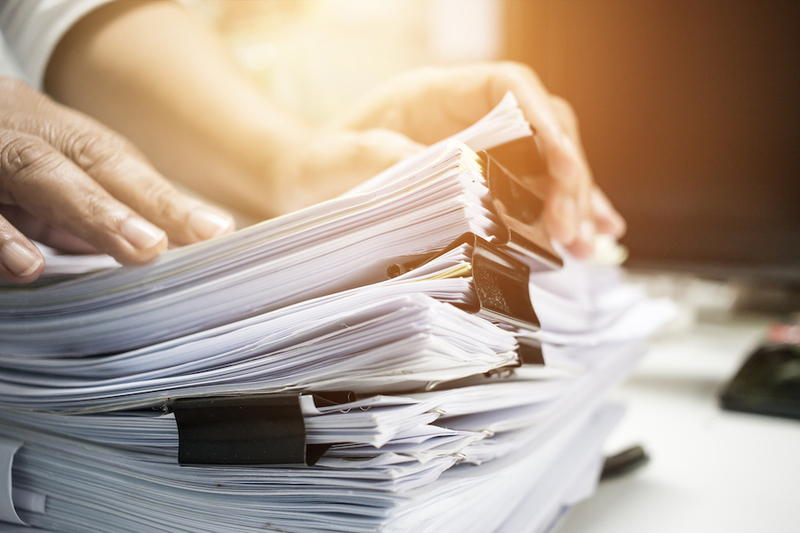 Having a good strategy in place for managing your paperwork is just as important for investing in property markets as it is for any other market, perhaps even more so. If you get it right, there are all sorts of benefits available to help maximise your investment returns. But get it wrong, and you're just deferring the paperwork pain and possibly even losing money. Why Is Paperwork Important in Property Investing? The first reason paperwork is important in property investing is to protect yourself legally. Owning property is fundamentally a game of legal rights. When you invest in a property, there will be an important set of legal documents you will need to prove you hold the title. Additionally, if you are renting your property out to tenants, there will be a set of paperwork relating to your agreements with the tenants such as a lease, condition report, bond, inspections, rent receipts, etc. Further, if your property is part of a strata title, then there will be a set of associated rights and responsibilities that go along with being part of the body corporate. Without good systems in place to manage the paperwork associated with these areas, you could be opening yourself up to unnecessary problems should there ever be some sort of legal issue associated with the property or the tenant. However, having a good system in place means that it will be relatively trivial to find the right paperwork anytime there is a need to do so. Another reason having a simple and efficient paperwork strategy for property investing is to get the highest financial returns on your investment. At its core, one of the main ways you make money from property investing is through collecting rent from tenants. Unfortunately, you don't get to keep all that rent you collect since there are expenses associated with holding your property. These expenses include rates, land tax, body corporate fees, water and sewerage connections, maintenance, advertising, etc. However, the cool thing is that you can claim a deduction for all the expenses associated with your property. What that means is that you don't need to pay tax on the portion of income your property received but was used to cover the cost of the running expenses. With good record keeping, you will be able to maximise your deductions when it comes to tax time and thus reduce the amount of tax you pay each year. However, it is so easy to simply pay a bill and forget about keeping the receipt or throwing it on a general pile only for it to become lost forever. Anytime this happens, you are basically throwing good money away since it is that receipt (or tax invoice) which is the key to unlocking the deduction in future. What Can You Do to Simplify The Paperwork? Depending on your time and level of interest when it comes to investing systems, there are few approaches you can take to keep your property investing paperwork in order. By far, the simplest thing you can do is simply have a box set aside and dedicated to your property and put all the relevant paperwork into it. I wouldn't recommend this as an effective long-term strategy but it's an easy starting point and way better than doing nothing. A step up from there is to compile all your property investing paperwork into one of those lever-arch folders. You can separate each category or type of document by using those thin cardboard dividers. If you want to take it hi-tech, you could go the paperless office route and turn everything into an electronic file using a scanner or camera. This approach takes a bit more effort to scan the paperwork or snap photos of them and upload them to your computer. However, the benefit is you'll always have an electronic copy on-hand should you ever need to find it. From there, you can use your own preferred electronic document record keeping system or technique to manage the paperwork. There's no time like the present to sort out your property investing paperwork strategy. Why not grab a cup of tea now and check out your own approach? Is there anything you can do to put things in order? If there is, go for it. Grab a hole punch and start putting that paperwork into a folder as a start. Trust me, the day that next property issue pops up, you'll thank yourself for having everything in order. Your bookkeeper and accountant will also love you for it and your wallet might grow a little more as a result. Dan Miller is CEO and head of Business Development at Trade Guardian, Canberra Bookkeeping and Business Administration service provider.